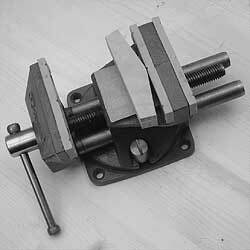 This compact and inexpensive vise is better than nothing. The jaw capacity can be doubled from 89mm (31/2") to 178mm (7") by removing the front jaw from the body and inserting it in the back, the latter beeing mounted on a 360 degrees swivelling base. By using a specially shaped wooden caul which just rests on the surface as shown above, it is possible to safely fix non-parallel work like for instance a guitar neck.